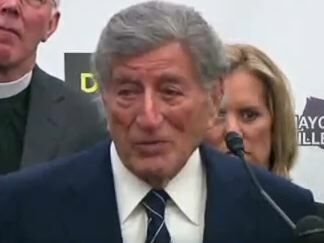 Singer Tony Bennett, along with celebrities such as Chris Rock, held a press conference in Washington, D.C. on Tuesday to raise awareness of gun violence and push for gun control. In his remarks, Bennett likened the opposition to more gun control laws to Nazi Germany. Bennett said opponents had to be "told off" like the Nazis. TONY BENNETT: It's the kind of turn that happened to the great country of Germany, when Nazis came over and created tragic things, and they had to be told off. And if we continue this kind of violence and accept it in our country, the rest of the world's going to really take care of us, in a very bad way.